The Legion was very pleased to get to last weekend’s London Comic Mart http://londoncomicmart.co.uk/ (NB the October date has been changed from the 6th to ???). While old faces Tim Bateman, Martin Hand and Dave Howarth made welcome if rare appearances, there was a notable absence. Steranko fan Alistair didn’t show up. He’s pretty much a regular attender, and the Legion was hoping to show off a recent find, viz and to wit Captain America no. 104, August 1968. 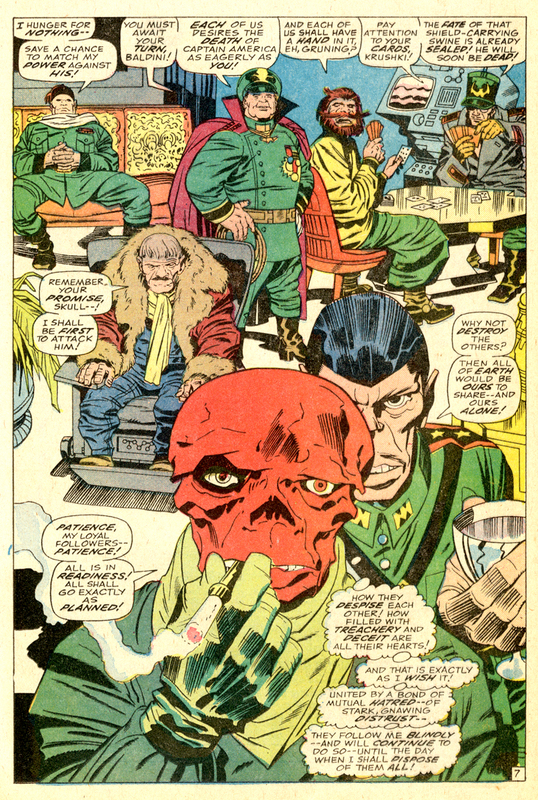 In fact we did a bit of a show-and -tell anyway, but since the August mart has been cancelled (hotel refurbishment) we will now have to wait ’til at least Sept 15th to find out if our pal the Steranko fan knows about page 11. “Page 11?” do I hear you say? Glad you asked. But unless you skip ahead you’ll have to wait a moment for that. The Legion only found out about this little gem recently. This period of Captain America contains a few gaps in our generally complete reading history of the major Marvel superheroes. In 1968 the Marvel addict in the suburbs of London was not supplied with a very regular fix. Even if this comic had turned up among the sporadic piles at the local a newsagent, with our limited funds the young Legion may have gone for a nearby Thor or Strange Tales instead. Looking back now, it appears to the Legion that Kirby’s art on Cap around this time may have been looser somehow than on other books, foreshadowing his work on DC’s Jimmy Olsen, Forever People etc. some two years later. This could be an illusion caused by the different inking styles employed; Colletta and Joe Sinnott certainly kept consistent surfaces on Thor and the FF which could have moderated the impact of a changing Kirby style. On Cap it was a case of musical inkers. The horrible work of Syd Shores, for example, was often another reason why the young Legion might have steered clear of Captain A. And ever since, until Lo! these last few months, a few issues of Cap from this period have remained unread. No. 104 is a rare instance of Jack Kirby artwork inked by Wally Wood studio alumnus Dan Adkins. The effect is somewhere between Joe Sinnott and the more “pure Kirby” look achieved by Mike Royer a few years later at DC. From a 2013 perspective, I can see Kirby’s magic shining through to fabulous effect. But another particular reason for celebrating this comic today is the guest appearance by Nick Fury, Agent of SHIELD on page 11. The Overstreet Price Guide doesn’t list this, but occasionally you will find it stated elsewhere that page 11 has inking by legendary artist Jim Steranko. 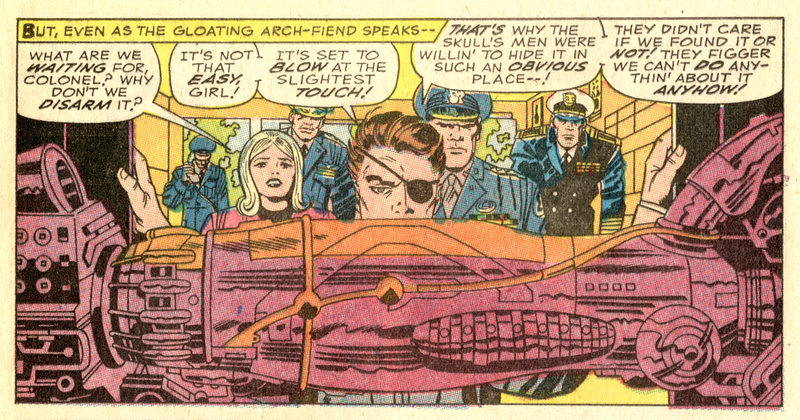 It’s not a complete inking job; the Legion is pretty certain that it’s only Nick Fury’s head that was graced by Jim’s hand – and we’re not sure about panel 2. You can check out the whole page and a close-up look at a couple of panels below. So, we have a double-whammy on the guest starring front; Nick Fury drops into Cap’s book and brings his pal Jim with him. It’s perhaps more likely by mid-68 that Steranko happened by the Marvel office while Kirby’s pencilled pages were around to be graffiti’d on. We hear a rumour that Adkins refers to this in an interview in Amazing Heroes 167. Anyone have access? For those of a nervous disposition who don’t have the comic to hand, stop worrying. Tony Stark manages to deactivate the bomb, just in the nick of time. Another guest appearance? was he drawn by George Tuska? Alas, a double negatory on that. It happens off-panel. Never mind. This comic is enough of a gem without any additional riches. The Legion is indebted to fellow collector Paul Hudson for this particular four-colour fix. It didn’t meet his own exacting standards, as some loony had glued the last page to the inside back cover. Paul had a batch of these comics. A collector who didn’t like letters pages? He’d also cut out many of the “next issue” captions. Perhaps they interrupted the flow of his reading from one issue to the next…? Gives a whole new meaning to the label “continuity freak”. 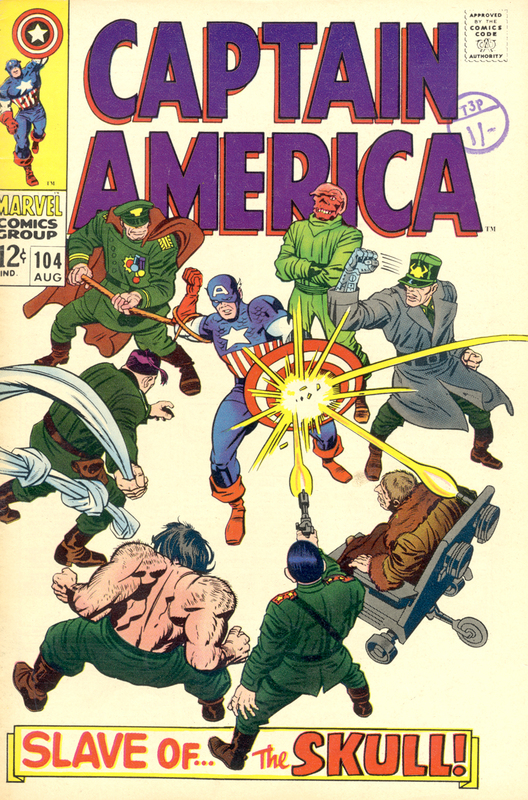 This entry was posted in Avengers, Comic-book art, Comics and tagged Avengers, Captain America, Dan Adkins, Jack Kirby, Jim Steranko, Joe Sinnott, John Buscema, Mike Royer, Nick Fury, Samuel L. Jackson, SHIELD, Stan Lee, Thor, Vince Colletta, Wally Wood. Bookmark the permalink. 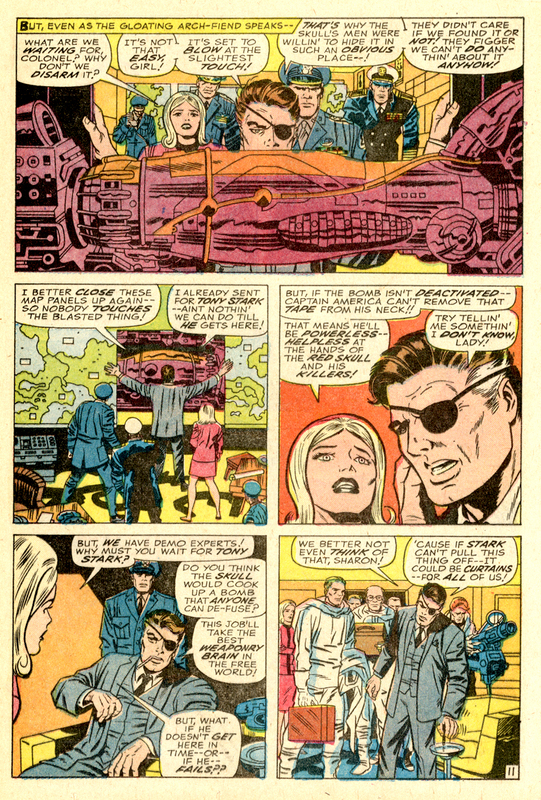 AH : Didn’t Steranko ink a couple of pages of Kung Fu? GULACY : That’s right, Steranko was visiting Dan one day, looked at this GULACY stuff and started noodling around. Actually, he only inked one full page. Thanks Simon. The Legion got back on the case, and found that it was a letter in Amazing Heroes 167 from Dan Adkins, not an interview. 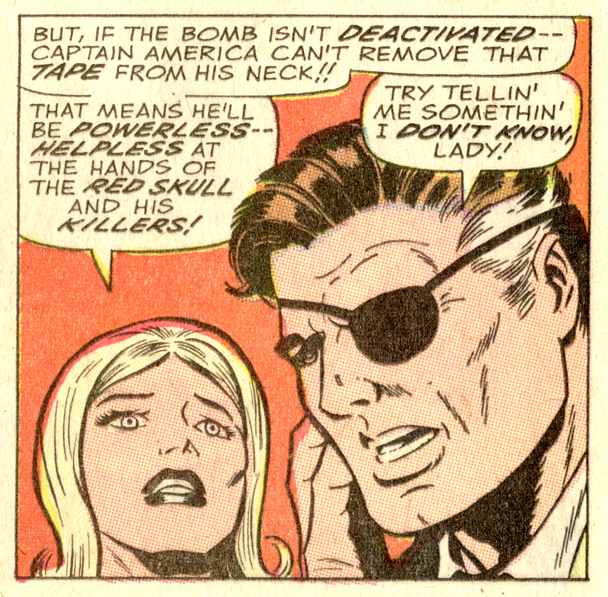 We feel some more Steranko-hunting coming on.